It’s true, as you’ll see in following recipes, they all sort of follow a pattern. 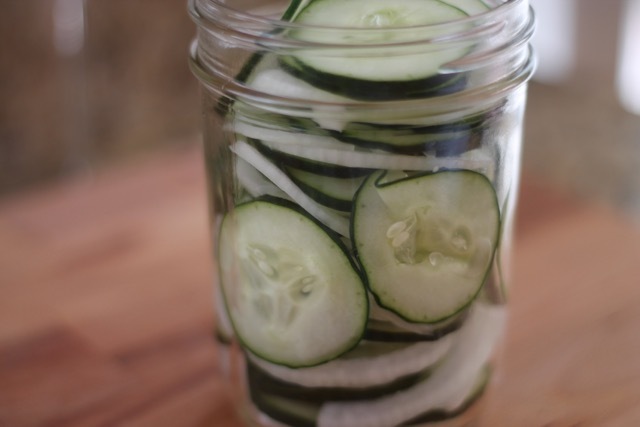 You’ll be pickling pretty much anything you want it no time at all! I enjoyed the process, but waiting a week to try them was a little daunting. I’m a “want it now” kinda girl. I was good though and waited the full week before digging in. For the cucumber pickles, we have one jar of sweet and one jar of sour. They have the same basic ingredients, one just has a little more sugar than the other. Verdict on these…The sweet were WAY too sweet. I don’t like sweet pickle to start with, but they were not Good Eats to me. The sour however were a definite winner. Next time I would cut the sugar to 1/4 cup, but they were really delicious! Next up cauliflower. 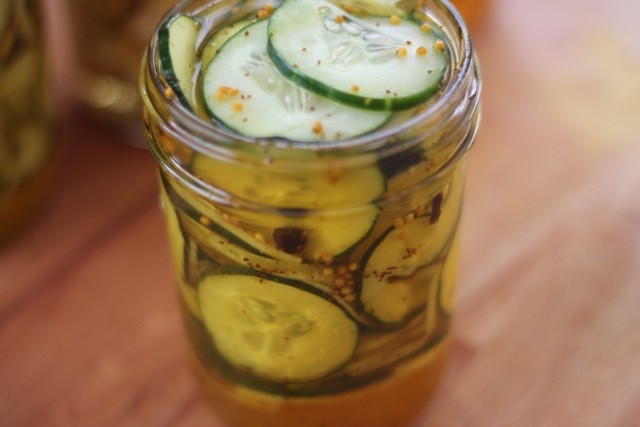 Yes you can pickle cauliflower, who knew! Not me anyway. The liquid process is still the same, we’re just changing up the spices a bit. Crush all the spices up with a Mortar and Pestle. Heat the canola oil in a heavy skillet over medium heat. Crush the cumin seed with the coriander seed and add to the pan. Add the curry powder, ginger, and garlic to the pan. Cook these spices, stirring until the oil colors and the spices are fragrant. Add the cauliflower florets to the pan and toss to coat. These were surprisingly good! I wasn’t sure what to expect, never having pickled cauliflower before, but the spices were on point. Good Eats! And now on to the carrots. I was most excited to try these! These were a bit of a let down. They had a good flavor, but weren’t nearly spicy enough. I would double the spice next time. They have definite potential. Finally, fruit. 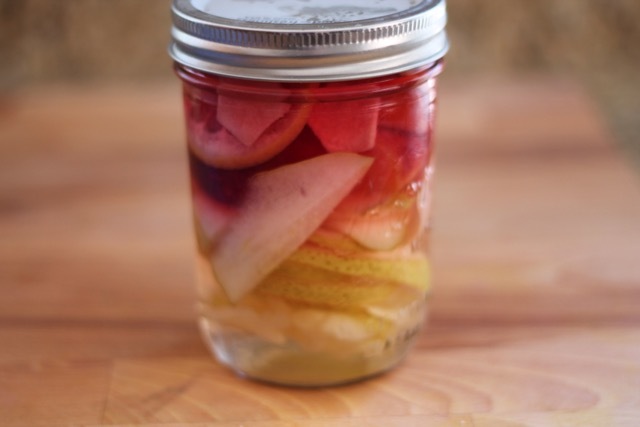 Never would I have thought to pickle fruit, but this is what I love about making all these recipes, you get to try new things! 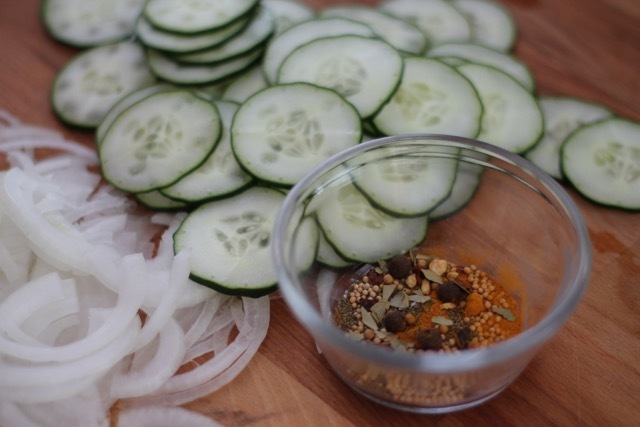 Again same basic pickling principle as with the veggies. These were not bad. Not my favorite thing, but an interesting flavor, sweet and tangy. Good summer dessert, definitely refreshing! There you have it, Pickles 5 ways. 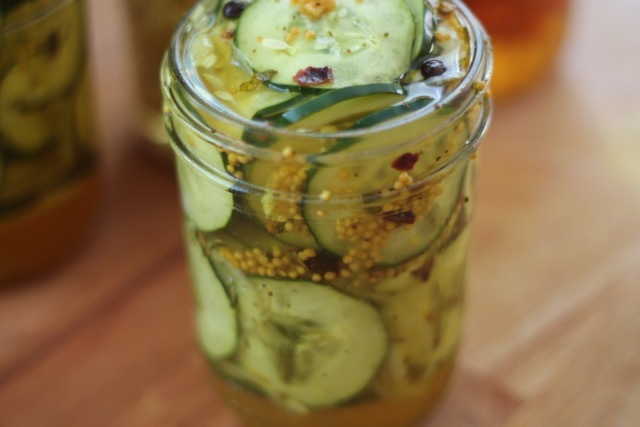 Are you now inspired to try Pickling on your own? Interesting…pickled cauliflower and fruit?!? Learn something new every day! Reblogged this on Sarah 'n Spice. I haven’t pickled since two summers ago!! I need to make some pickles.. my family loved them. Love of great inspiration here today!! I hadn’t pickled in a long time before this as well, so happy I did. Glad to be some inspiration! If you like sweet pickles you should like them 🙂 I know, it’s like torture waiting that long!